In 1987, Frank co-founded the Zen Hospice Project, the first Buddhist hospice in America. 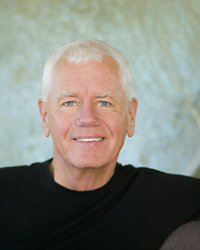 In 2004, he created the Metta Institute to provide broad based education on mindful and compassionate end of life care. His groundbreaking work has been widely featured in the media, including the Bill Moyers television series On Our Own Terms, The Oprah Winfrey Show, and in numerous print publications. In 2001, he was honored by H.H. Dalai Lama for his years of compassionate service to the dying and their families. Frank is a dynamic and visionary Buddhist teacher and international lecturer. He is a frequent keynote speaker for many healthcare organizations such as Harvard Medical School, the Mayo Clinic, the National Hospice and Palliative Care Organization and others. He teaches at dharma centers around the world including Spirit Rock Meditation Center, the Upaya Zen Center, and Rigpa's international centers and many more. His public programs, writings and recordings have introduced thousands to the practices of contemplative care. He is the author of Five Invitations: Discovering What Death Can Teach Us About Living Fully and the audio series Being a Compassionate Companion. For more information visit www.mettainstitute.org.